Whether you’re camping out in the wide-open wilderness or under a bunch of blankets in the middle of the living room, one of the best parts of the entire experience is gathering around the campfire (or a few flashlights and construction-paper flames) to tell a tall tale or two. Usually, when you think of campfire stories, bloody hooks and calls that come from inside the house are the first things that come to mind. But if you’ve got littler kids — or if you yourself have a horror threshold that hovers somewhere between Goosebumps and The Blob — you might find yourself at a loss when the marshmallows-on-sticks come out. 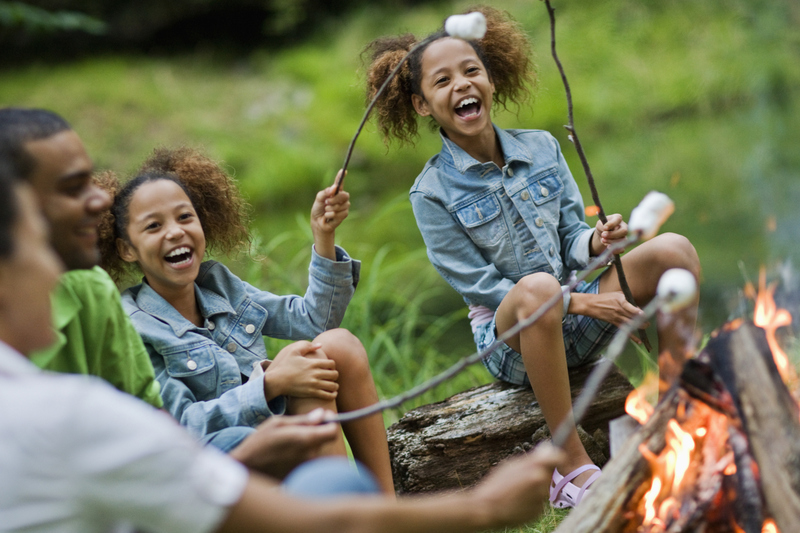 Well, we’ve got you covered with these 15 stories that leave the fright behind, and you’re sure to find one that’s perfect no matter what age your fellow campers happen to be. This easy and quick rhyme is great for the preschoolers who might not have the attention span necessary to sit for a long story hour. Make sure you keep the marshmallows handy though — this one’s sure to give them some ideas about dessert. George makes his usual monkey mischief while camping with the Man in the Yellow Hat and meets a special forest friend along the way. Upbeat and cheerful, this music and movement song will help kids get in the camping spirit and get their wiggles out at the same time. Kids will catch on quickly to the words of this soothing song. It’s perfect before bedding down in your tent, camper or cabin and has the kind of outdoors and nature theme that makes it perfect for roughing it. While this one isn’t camping-specific, Eric Carle’s illustrations and story will keep kids riveted, and afterwards you can all grab a few jelly jars and see if you can catch some fireflies of your own after dark. This silly story about a man making fruit salad is best enjoyed by fans of cheesy dad jokes and will have your kids groaning in no time. Perfect for kids that are in-between “babyish” books but wouldn’t be into anything spooky, S is for S’mores is a straightforward camping alphabet that could come in handy if you have a troop of scouts in tow. This Ojibwe story of how the bear came to have a short, bobbed tail is a campfire classic and a great way to sneak a moral into the campfire stories; plus, the tale of trickster otter will give kids something to chuckle about. Speaking of morals, Aesop’s fables are always worth a retelling, and we’ve all heard the one about the wise ants and foolish grasshopper so many times that it isn’t necessary to memorize the entire thing perfectly. Not a bad way to encourage your kids to help gather kindling and supplies for the campsite, either. Another great one for the dad-joke connoisseurs out there, The Rope tells the tale of a sneaky poker-playing rope that uses a terrible pun to get out of trouble. Dark but not overly morbid, this silly tale of an extraordinary pig that saves a family’s life is one that the littler kids might not like but older campers will get a chuckle out of. This one’s equally twisted without being too messed up, but proceed with caution anyway. Spoiler: this isn’t actually a scientific explanation as to why cats land on their feet. This story is done just like that repeating-verse road trip anthem “This is the Song that Never Ends.” It’s good for pulling one over on your kids the first time, but once they catch on it might be time for the adults to break out whatever adult refreshments they might have packed for the trip. The tale of the man who just couldn’t take a hint starts out seriously enough, but once you get to the end, the story gets sillier and sillier and your kids won’t be too sad to see the dense protagonist meet his fate. This short and groan-worthy story ends with a pun that some adults won’t fully catch the first time around. It’s a great way to end the night, and either your kids will get it immediately and beg you to stop telling stories, or they’ll obsess over it all night. Either way, you’re off the hook.